Diamonds throughout most of history depended on candle lighting to be really appreciated by people, very rarely were diamonds worn in plain daylight. Royalty and their courtesans would embellish themselves with jewels mainly to grand nighttime affairs and balls. Candle lighting meant low & warm lighting environments, such environments were a perfect setting for diamonds to display their optical capabilities as opposed to their colored gem counterparts which required a lot of light to display their attractiveness. The movement of faceted diamonds enable viewers to enjoy their colorful and splendid play-of-light. The fire a diamond radiates is partially responsible for the phenomena. What is inducing diamonds to display such optical wonders? What is colorful fire in diamonds? How does it occur? Here is a short explanation. Light enters a faceted diamond usually from the top section (light comes from above as general perception), the crown of a diamond. The crown facets split up the light upon entry, some of the lights will reflect back as white (e.g. Diamond brilliance), while some light will refract into spectral colored flashes, e.g. fire. Fire is the dispersion phenomenon which occurs when light waves travel through a three-dimensional transparent medium such as a diamond. The refraction index, which is 2.42 in diamonds, reduces the speed of the light causing refraction upon entry and therefore to spread. 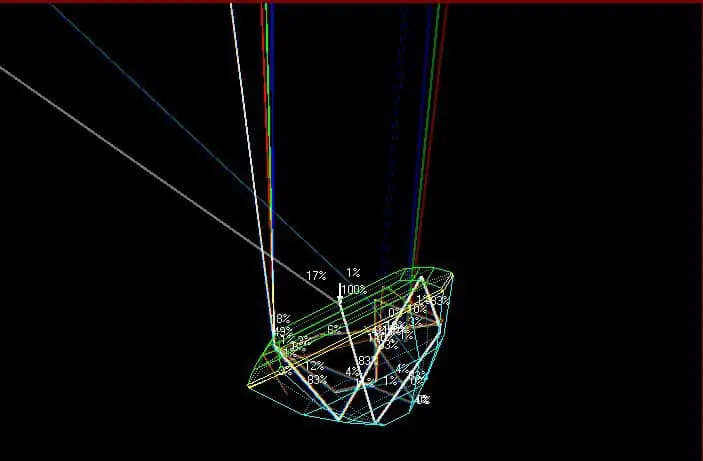 Light continues its journey within the diamond while widening its light bands to its dispersed components (spectral colors). Dispersion is the internal break-up of white light into a rainbow of spectral colors. Upon being bounced off the diamond’s internal facets and virtual facets, light will disperse into wider spectral colored flashes of light. These flashes exit the Diamond towards the observer and creates the “Fire”, what the human eye sees as a range of lighting and flashing colors, from red to violet and the entire spectral range in between. Darker, warmer lighting environments enable us to notice the dispersed light flashes in a more detailed manner resulting in stronger and sharper colors (hence, candlelight lighting above). In older cuts this phenomena is much more prominent as the facet surfaces are larger (by design) therefor displaying significantly larger colored flashes that can be picked up much more intensely than with modern cuts where the facet surfaces are usually smaller and thinner (splintery). When the above occurs in conjunction with movement, we get an optical light orchestra allowing enjoyment of the scintillating radiance diamonds are famous for. Research on diamond scintillation is still quite in its initial stages, we have no way to quantify the scintillation phenomena yet. Scientifically, scintillation is a dynamic sparkle effect which, when properly balanced, offers the viewer a phenomenal play-of-light. Scintillation occurs from the movement of either the observer, the diamond or the light source, or a combination of any of the three. 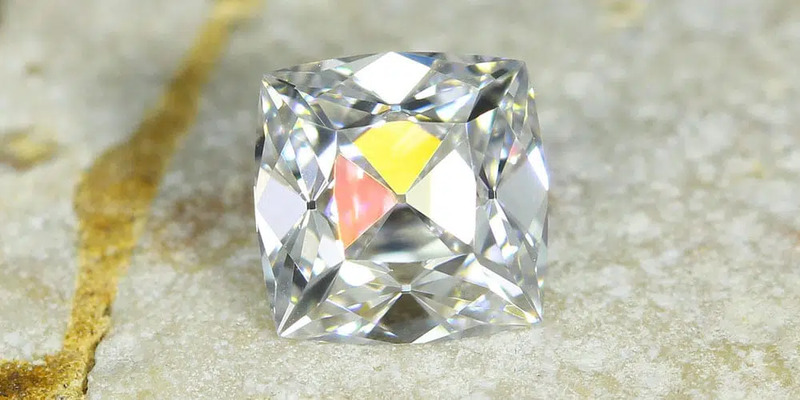 Also important to mention is that in diffused lighting environments, additional light which is added to the existing light already active in the diamond may overpower the play-of-light, causing the diamond to appear brighter losing the colored-flashing phenomena altogether. The reason that scintillation occurs during movement is related to what we identify as Disturbed Visual Communication (DVC). When light travels through a transparent medium reaching the eye without any movement, the observer receives a direct undisturbed visual communication and scintillation will not occur. However, when light travels through a transparent medium and exits towards the eye of an observer while in motion, it is no longer considered direct communication and the information the observer receives is disturbed and uneven, thus creating the scintillation, or sparkling, effect. This phenomenon is insignificant in most materials. However scintillation occurs to a great degree in cut and polished diamonds that have been applied with facets and virtual facets causing light communication between the observer and the diamond to be highly disturbed, or scintillating.